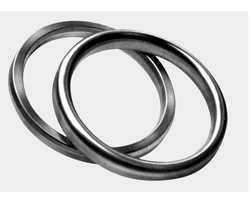 We manufacture high quality Silicon Gaskets that are widely used in different industrial applications. These are highly acclaimed among our clients due to their resistant to high temperature and heat. We made these using fine quality material which we sourced from the trusted vendors of the industry. Moreover, we also assure timely delivery of our products. We are engaged in manufacturing, exporting and supplying finest quality range of Ring Joint Gaskets. These gaskets stop leakage that causes corrosion around manholes and hand holes in steam boilers, water heaters and air tanks.